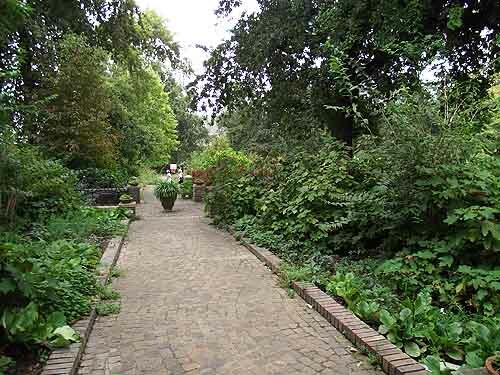 Stellenbosch the second oldest town in South Africa is home to the winelands of the Western Cape. There are many wine farms in the region and all of them produce splendid wines. Most of the farms in the area were given to farmers way back in the 1670's by Simon van der Stel the then Governor of the Cape. 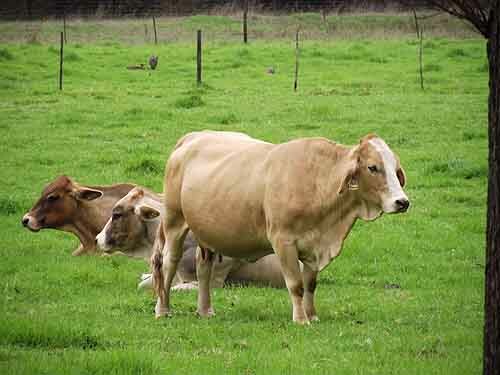 One of the farms that came into being during that era was the Rustenberg farm which was given to Roelof Pasman who came to South Africa from the Rhine Valley in Germany. Pasman chose the Rustenberg farm because of the red granite soils and the cool coastal climate which he suspected would give him excellent terroir. He obviously knew something about wine and the soil as he made an excellent choice when selecting the land he wanted to farm on. The Rustenberg farm is situated on the slopes of the Simonsberg at the end of a 2 to 3 kilometre tree lined road that winds up the hill to the farm. The road although bumpy in parts crosses streams and meanders past the farm workers cottages where the gardens are planted with roses and then continues past a meadow where a small herd of angus cows lie and chew the cud, before arriving at the beautifully renovated old farm buildings and winery. The vineyards which date back to 1682 grow near the winding road and up into the hills above the farm. A number of different cultivars grow in them and the farm produces both red and white wines. Wine was first produced on the farm in 1682 using old farming methods and over the next 100 years production was pushed up to around 3000 cases per annum. Production grew so rapidly that in the early 1800's a new wine cellar had to be built. 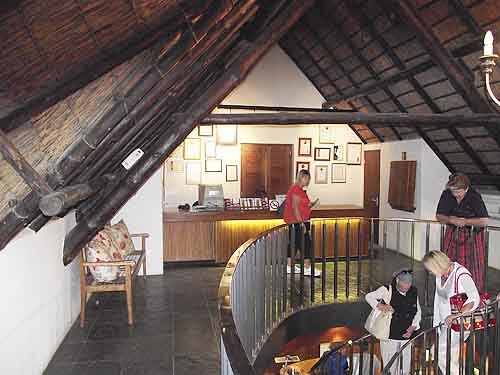 The upstairs floor of the double storey tasting room with its circular stairwell. 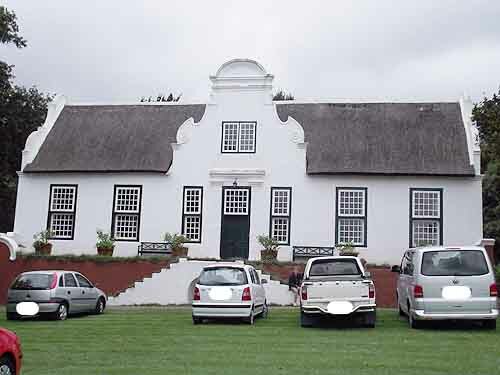 Shortly afterwards Jacob Eksteen the then owner of Rustenberg decided to split the farm into two parts and gave one half to his son in law who named his half Schoongezicht. Eksteen must have been most upset when his son in law sold the farm a short while later. Eksteen must have forgiven his son in law as he and the new owner of Schoongezicht farmed next to each for years with both farms flourishing and reaching their peaks in 1812, something that might not have happened if Eksteen had been bearing a grudge. Unfortunately bad times hit both farms in the 1850's when the vines contracted a root disease and died. During this period both farmers lost their farms because of a recession and bankruptcy caused by the vines dying. 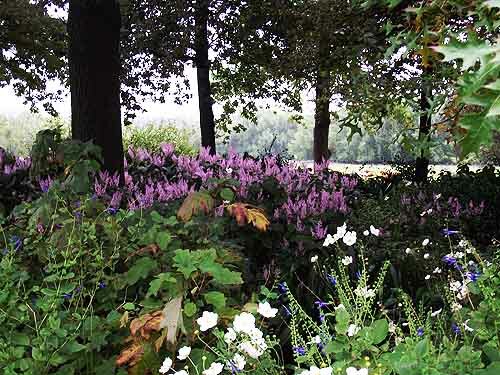 Both farms lay unworked until John Merriman bought Schoongezicht in 1892. 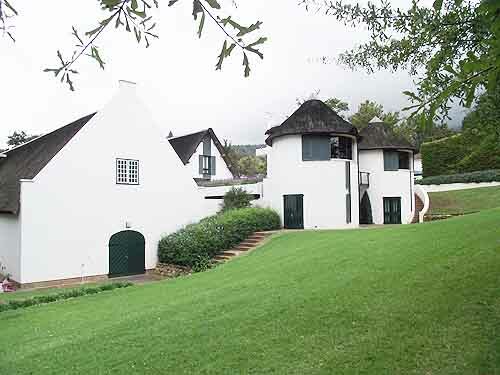 Two years later the Rustenberg portion of the farm was bought by Sir Jacob Barry who was married to Merriman's sister and the two farms were once again united through family ties although they remained separate farms. The farms changed hands a number of times over the centuries. Peter Barlow retired in 1987 and his son Simon took over the running of the farm. Under his watchful eye the farm has gone from strength to strength. In early April I had the pleasure of visiting the farm to attend a rare plant sale that was being held on the premises. The beautiful old Cape Dutch buildings which have been around since the early 1700's are still standing as are the old cow and horse sheds. The cow sheds have been turned into the cellars where the fine wines produced on the farm are created. The old horse shed next door has been converted into a beautiful two storey wine tasting room. Entrance to the tasting room is on the top storey of the building and one descends a circular stair case into the tasting room. A beautiful wooden counter has been made out of old oak wine barrels and is used to serve clients and friends wanting to taste the wines produced on the farm. A comfortable lounge area has also been included for those who like to sit down and enjoy a glass of wine. 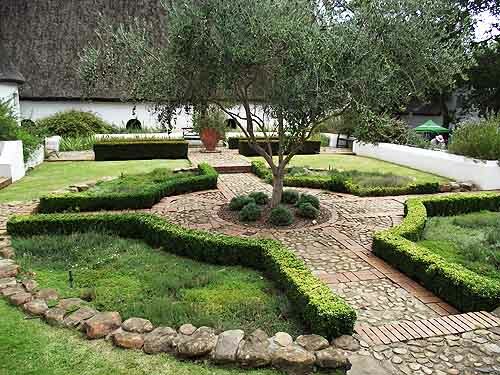 Not only does the farm produce lovely wines, it also has a stunning garden close to the old manor house and Cape Dutch outbuildings. 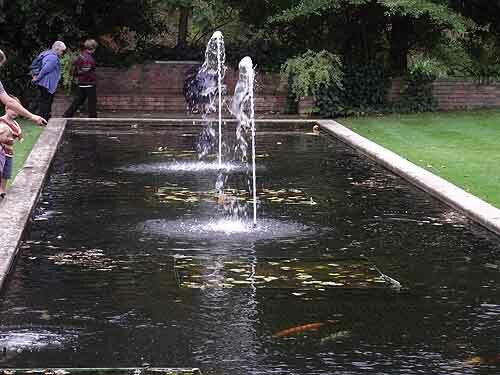 The gardens have some interesting features such as a large Koi pond with fountains, a large labyrinth as well as many little pathways and places to explore. 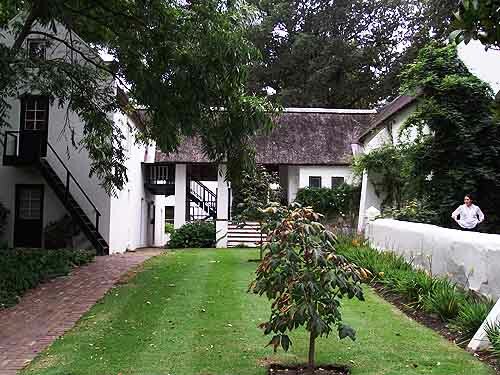 The farm is open daily for people to visit the wine tasting room and the beautiful gardens. 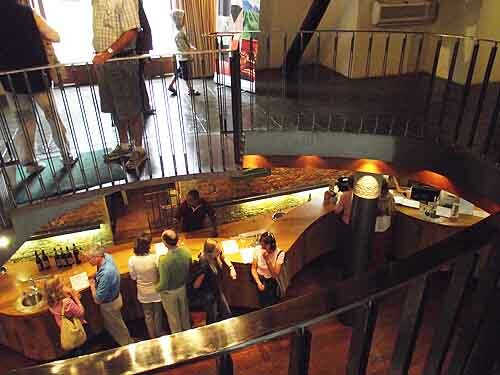 Just do not descend on the wine tasting room in large numbers as the owners will turn you away. They enjoy showing off their wines to small groups where they can gauge the reaction to the wines. 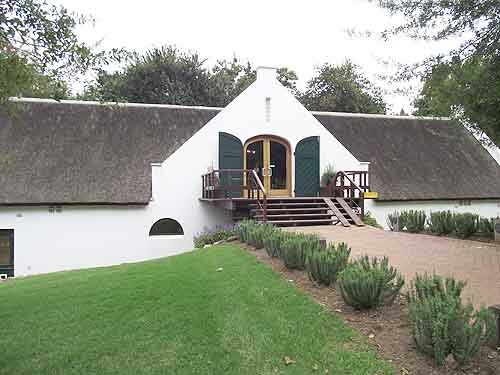 The Rustenberg farm invites visitors to come and see their interesting old Cape Dutch buildings, to taste their wines and to meander through their splendid gardens. 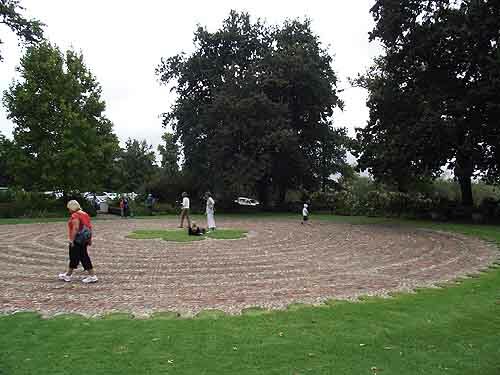 Take the time to visit Rustenberg farm, you will be glad you did.